The Humane Society of Central Oregon is celebrating national Adopt-a-Shelter Dog month with 50% off all dog adoption fees through the month of October. Visit the shelter to find your new best friend. There are all kinds of dogs at the Humane Society of Central Oregon waiting to meet you – big, small, purebred and mixed breeds. The staff will help you find the dog to fit your lifestyle. There are dogs ready for your next outdoor adventure or indoor relaxation. All adoptions include spay or neuter, health exam at local veterinarian, vaccination, microchip ID, collar, leash, food and more. 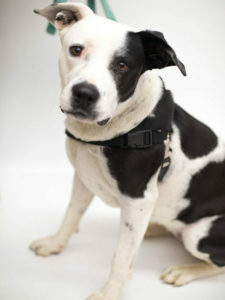 Want to help dogs during Adopt-a-Dog month but cannot add a four-legged friend into the family? 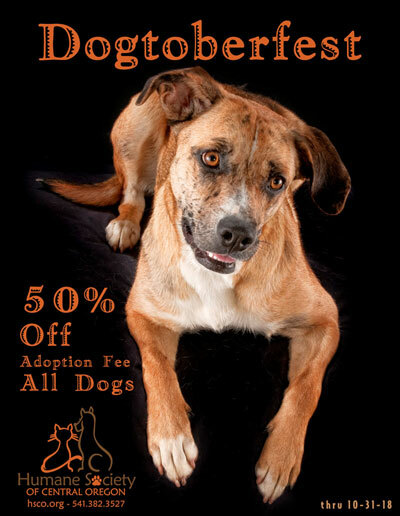 Donate dog biscuits and treats for shelter dogs waiting for a home. 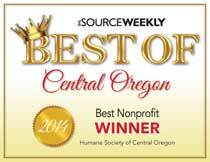 The Humane Society of Central Oregon is located just south of Reed Market Road on SE 27th Street in Bend. To see our adoptable animals visit hsco.org or call 541.382.3537. The shelter is open Monday through Friday 10:00 am to 5:30 pm, Saturday 10:00 am to 5:00 pm.